The Aero Club of South Africa Transformation and Development division and the Kranskop Glider Club at Brits Airfield hosted a successful aviation awareness day. Daniel Ralefeta and his team, as always, ensured a safe day of flying fun and informative talks. Daniel gave a drone display, while everyone eagerly awaited the arrival of a Motorfalke and a Lambada from Springs Airfield, the Motorfalke was to be used for flipping and the Lambada for glider towing. Read the full article in Pilot's Post. 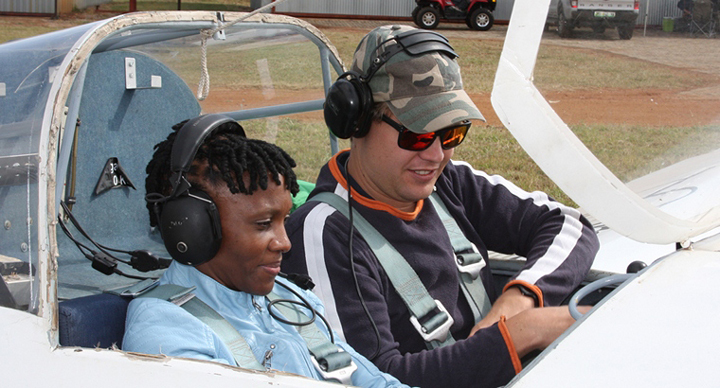 Below (from left to right): Brian Khumalo and glider pilot Richard Floyd. Photo: Garth Calitz. Above left: Daniel demonstrating RC drone flying. Above center: Gary Whitecross (left) from Airplay Aviation Flight School in Springs kept everyone's attention with a simple explanation of the principles of flight using a radio controlled aircraft as a display. Gary has on many occasions represented South Africa in international gliding competitions and is a strong believer in the principle that gliders make better pilots. Above right: Gift Kgadima, himself a product of the Aero Club of SA's T&D programme explained the ins and outs of parachute safety. Gift started his flying career at Airplay Aviation and is now well on his way to becoming a commercial pilot. Photos: Garth Calitz. Above left: Simon Tladi flying the Samba. Photo: Garth Calitz. Above right: Brits Airfield. Photos: Garth Calitz (left) and Daniel Ralefeta (right). The Aero Club of South Africa Transformation and Development division together with the Soaring Society of South Africa (SSSA) hosted a successful Touring Motor Glider Fly In, at Kranskop Glider Club at Brits Airfield. Daniel Ralefeta and his team: Elijah Rakoma, Joseph Lebitsa, Gift Kgadima, Thabang Kotlolo, Phemelo Kgoale once again out-did themselves making everyone feel welcome. Daniel joined forces with SSSA to promote Aviation Awareness amongst the youth and also invited many representatives from the Department of Sport and Recreation giving them a very personal introduction to the sport of gliding, offering flights in TMG's which for some of them was their first taste of flight. Official proceedings were kicked off by a warm welcome from the ever humorous retired airline pilot Capt. Karl Jensen while Daniel gave an informative talk outlining the importance of transformation in the aviation industry and shared a few of their recent success stories, these being the progress of two young men: Gift Kgadima and Simon Tladi. Both Simon and Gift have excelled after receiving opportunities, and both of them were piloting aircraft used to take visitors for flips on the day. Read the full article in Pilots Post. Above left (from left to right): Colonel Rama Iyer and Gift Kgadima. Above center (from left to right): Hanke Fourie, Colonel Iyer, Phemelo Kgoale, Thabang Kotlolo and Daniel Ralefeta. Above right (from left to right): Glider pilot Rainier Freibose and a happy passenger. Photos: Garth Calitz. Above left: Brits Flying Club, South Africa. Above right (from left to right): Robert Malan (NAC), Monakisi Franz Moraba, Orifha Mbedzi, Natalie Kyd (Senior Aviation Instructor at SAA Technical), Tumelo Mukua, Thenysia Krishna, Gift Kgadima, and Dy Moonsammy (WOA Chairperson and the Senior Manager of Learning and Development at Comair Limited). Photos: Garth Calitz. The Aero Club of South Africa Transformation and Development division, under the leadership of Daniel Ralefeta, hosted a Gliding day at the Kranskop Gliding Club at Brits Airfield on Saturday 28 June 2015. The event was intended to promote aviation awareness amongst the youth in partnership with the newly formed "Wonders of Aviation" Initiative. Wonders of Aviation, an organisation dedicated to inspiring South Africa's youth, enthusiastically headed by Robert Malan of the National Aerospace Center, was launched in May at the Mango career day at AFB Zwartkop. Wonders of Aviation is an international initiative and is the brain child of Donald Shenk, CEO of ACA Associates, a US-based aviation advisory firm. The outreach programme was designed to make use of mentorship programme to take the young members under their wings and guide them to careers in aviation. Many large role-players in the South African aviation industry have come out in support of this programme these include Comair, SAA, Mango, ATNS, Jonkers Sailplanes and the SA Weather service. Read the full article in Pilots Post here. On 21 February 2015, represensitives from the Department of Sport and Recreation visited Kranskop Glider Club based at Brits Airfield. Their intention was to evaluate and audit the programme but instead they were treated to a day of bushveld hospitality and flying. Simphiwe Mncube, Director Sport Support Services, Kgabo Matjane Director, DG's Office and Siphokazi Matholengwe Senior Sport and Recreation Coordinator for Mass Participation arrived early in the morning expecting a dull audit but Daniel Ralefeta, Chairman of the Aero Club of South Africa Transformation and Development division, had other plans. Read the full article in Pilots Post here.